Perennial plant. The root horizontally. Stem upright, simple, seldom in inflorescence branched, 50 - 80 cm high, more or less simply fibrous. Leaves protruding ovate, at the base heartbeat, at the edge rounded serrated, more or less fibrous, 4 - 12 cm long, 2 - 5 cm wide; the basal with long petioles, the stem leaves 2 - 3 pairs with short petioles up to sitting down. The blossom vertebrae converged into a cylindrical class inflorescence, the lower 1 - 2 spaced apart. The bracts are 5 - 6 mm long, almost equal to the calyx, broadly lance, fibrous. The 6 - 7 mm long calyx with a naked or at upper half fiber, 4 - 5 mm long tube; the teeth at the base are triangular, at the top shortly oval, two times shorter than the tube. The corolla purple with a lighter purple to almost white tube, 9 - 10mm long, slightly curved, at the top, as well as lips outside, short white fibrous; the lips are 4 - 5 mm long, the upper flat or slightly convex, entire, the lower 3-part with a large middle share. Stamen petioles slightly fibrous, yellow anthers. The walnuts are brown, tall, narrowly elongated, 3.0 mm long, 1.5 mm wide, the outer wall slightly convex, the upper edge with a short, large toothed appendix. Economic importance. Used in official and folk medicine. Contains bitter and tanning substances, essential oils. 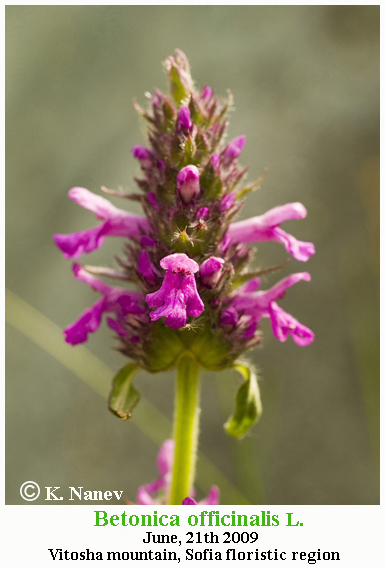 Stachys officinalis is commonly known as common hedgenettle, betony, purple betony, wood betony, bishopwort, or bishop's wort. The French common name is betoine, and Betonie in German. It is a perennial grassland herb. Pliny (25, 8, 46, § 84) calls the plant both betonica and vettonica, claiming that the Vettones used it as a herbal medicine. 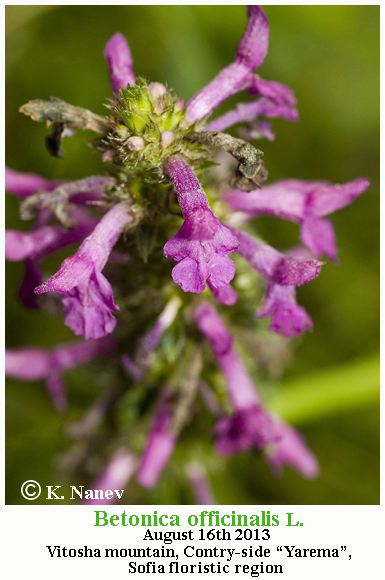 The word stachys comes from the Greek, meaning "an ear of grain," and refers to the fact that the inflorescence is often a spike. S. officinalis is a perennial grassland herb growing to 30 to 60 cm (1 to 2 ft) tall. Its leaves are stalked on upright stems, narrowly oval, with a heart-shaped base, with a somewhat wrinkled texture and toothed margins. The calyx is 5–7 mm long, with 5 teeth, edged with bristles. The corolla 1–1.5 cm long. Its upper lip flat, almost straight when seen from the side. The anthers stick straight out. It flowers in mid summer from July to September, and is found in dry grassland, meadows and open woods in most of Europe, western Asia and North Africa. In the British Isles it is common in England and Wales, but rare in Ireland and northern Scotland. The aerial parts contain phenylethanoid glycosides, (betonyosides A-F) and acetoside, acetoside isomer, campneosides II, forsythoside B and leucosceptoside B. The roots contain diterpene glycosides, betonicosides A-D and the diterpene, betonicolide. The plant was commonly grown in physic gardens of apothecaries and monasteries for medicinal purposes. 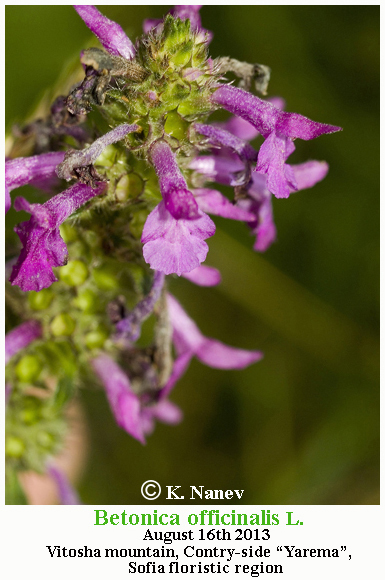 Betony was an ingredient of "Pistoja powder," an old remedy for arthritis and gout. It was also claimed to be effective against snake and dog bites, and was believed to be a cure for drunkenness. Richard E. Banks stated that you should "Eat betony or the powder thereof and you cannot be drunken that day." John Gerard (1597) said that "It maketh a man to pisse well." While Nicholas Culpeper stated that, "...it preserves the liver and bodies of men from the danger of epidemical diseases, and from witchcraft also" and "...this is a precious herb, well worth keeping in your house." He also states that betony is astrologically ruled by Jupiter and Aries. 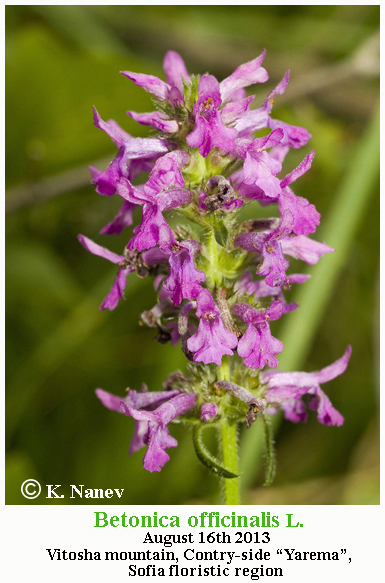 Betony has also been used in traditional Austrian medicine internally as tea, or externally as compresses or baths for treatment of disorders of the respiratory tract, gastrointestinal tract, nervous system, skin and gynecological problems. 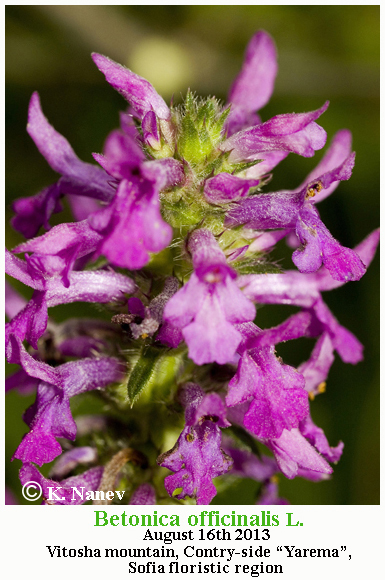 Modern herbalists prescribe betony to treat anxiety, gallstones, heartburn, high blood pressure, migraine and neuralgia, and to prevent sweating. It can also be used as an ointment for cuts and sores. 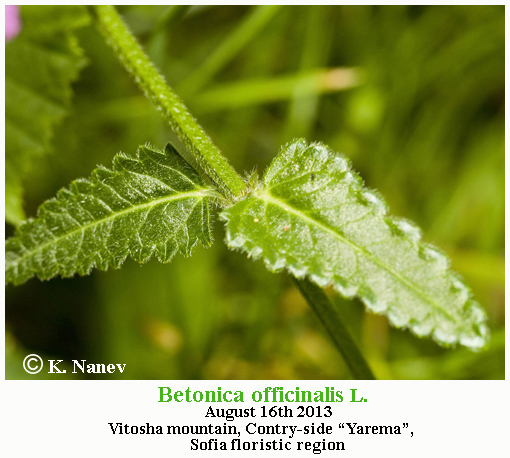 Betonica officinalis L. is a synonym of Stachys officinalis (L.) Trevis. 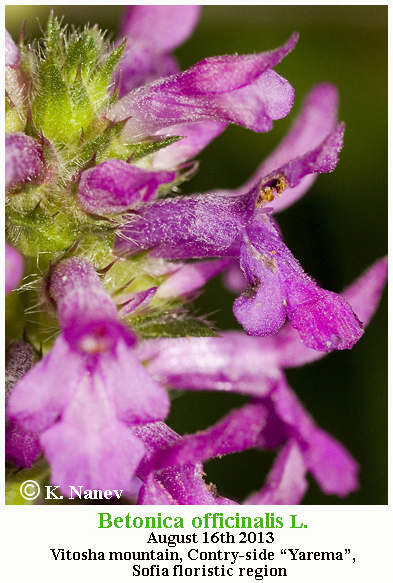 This name is a synonym of Stachys officinalis (L.) Trevis.. The record derives from WCSP which reports it as a synonym (record 21029) with original publication details: Sp. Pl. 573 1753. Flowering Time: Blooms: VI - VIII, Fruitful: VII - IX. Distribution in Bulgaria: Growing on grassy shrubs, mostly in deep forests and meadows in the lowlands and mountains. Distributed, from sea level up to 1400 m altitude. (Conspectus of the Bulgarian Vascular Flora) = conspectus&gs_l= Zlc. Distribution: Europe (north to south of Sweden, up to 62 ° north latitude), Western Siberia, Caucasus, South-west Asia (Asia Minor), North Africa (Algeria).